Chrysetta Patterson, MSW, received her Master’s level training Adelphi University School of Social Work where she received a scholarship for her work on domestic violence. She is currently working with the Workforce Institute a collaboration between the City University of New York (CUNY) School of Professional Studies and the Administration of Children's Services (ACS) in New York City. At the Workforce Institute, she holds the position as Senior Evidence-Based Model facilitator, with a training focus on Partnering for Success and Family Assessment Response (FAR). Previously, Chrysetta has held positions as a Senior Education Specialist with the State University of New York (SUNY) Stony Brook, Program Director for Services for the Underserved and Training Coordinator for New York Foundling. 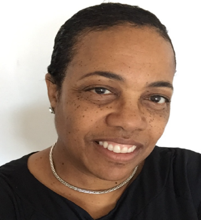 Ms. Patterson has also been a consultant/facilitator to The Council of family & Child Care Agencies Inc. (COFCCA) the Adolescent Services Resource Network (ASRN) at Hunter College school of Social Work and many other New York city and state childcare agencies. Chrys is currently a Partnering for Success Certified trainer and consultant. She has provided training and consultation to multiple practitioners in sites the NCEBPCW is working with.